This ca. 1825 Bakshaish (11'7" x 18'10") from Northwest Persia is exceptional both for its singularly expansive dimensions and its status as among the earliest existing examples of this style’s cherished “Dragon” design. As a very large weaving project, rare for the village level, this one-in-the-world piece is a window into vision of the pre-commercial Bakshaish psyche. Oakland, Ca - In his annual letter sent to clients, Claremont Rug Company founder/president Jan David Winitz, highlighted the mix of technology, artistic/investment value and the appreciation of specific Oriental rug types from the “Second Golden Age of Persian Weaving,” ca. 1800 to ca. 1910, as the primary factors that influencing acquisitions decision by connoisseurs. Winitz, who founded the Gallery in 1980, singled out the combination of “marshalling of website technology, social media and today’s transportation systems, that allowed our worldwide clientele to pursue extremely hard-to-find antique art rugs even more easily” as primary factors in Claremont’s “tremendously successful year. The internet played a role in our transactions with a record 75% of our clients.” Claremont was introduced to the internet in the late 90’s by a client, John Warnock, who was Adobe System’s co-founder and Chairman at the time. • A project furnishing a massive estate in Italy. 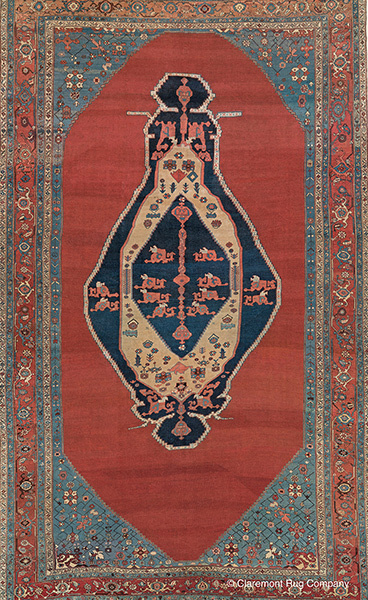 Winitz predicted that top-tier examples of central rug styles such as Persian Bakshaish, Hadji Jallili Tabriz, Serapi, Ferahan Sarouk, Laver Kirmans and Caucasian tribal rugs will continue as a central emphasis of clients in 2019. “As I reflect on 2018, I can definitively say that the high-end of the antique Oriental Rug Market is more vibrant than ever,” he said.